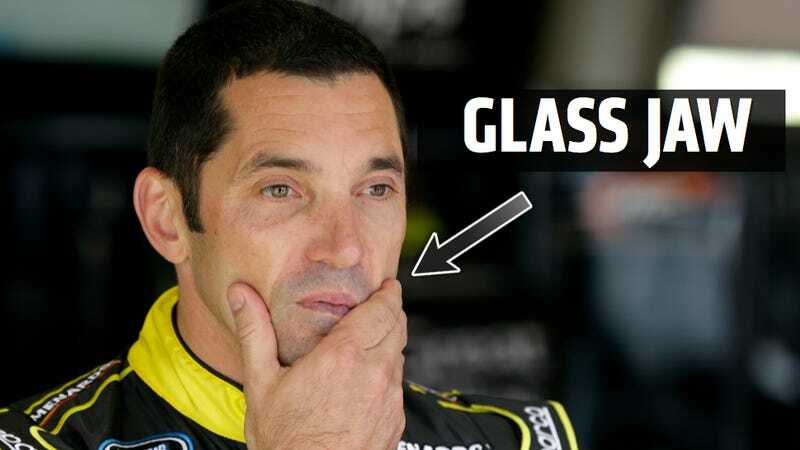 If you missed the Max Papis slap yesterday we've got a GIF of it below. Needless to say, they're going to start calling him 'Glass Jaw' Papis now that he claims the slap dislocated his jaw. Really? Yesterday's NASCAR truck race in Bowmanville, Ontario saw two drivers get PIT-maneuvered out of the way on the last corner of the last lap. On the front row it was Ty Dillon getting spun by Chase Elliott and not far behind them was Max Papis nudging Mike Skeen into the grass. Someone alleged to be Mike Skeen's girlfriend Kelly Heaphy slapped Papis right in the face after the race, which the Italian driver seemed to sort of laugh off at the time. Now he tells ESPN that he suffered a dislocated jaw. Here's Mike Skeen's version of events from his Facebook page adds some interesting context. Finally back to the States with a charged phone. Great race overall for us, but a rough end. I'm not sure what the TV showed, but the 14 got into my bumper numerous times to pass me with a couple laps to go. I never gave him a cheap shot in the rear. I made an aggressive move in the final corner to get position and I don't think he saw it coming...hit me in LR corner and put us in the tires. If it was such a rookie move and I completely missed the corner, he should've let me wreck myself and he could've finished just fine (not what would have happened). Instead he tried to turn in even though I had a nose ahead. The drama after the race was started by him. He tried numerous times on the cool down lap to wreck me again or drive me into other parked trucks. When we finally got behind the wall, I got out and talked to him face to face, but there was no reasoning with him. 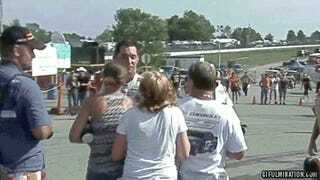 I didn't know about the slap, but that was relatively tame considering he barged our trailer later and tried to pull her down the stairs in front of a NASCAR official and several members of our team. She has bruises to prove it. Those are the facts from my perspective. The great thing about racing is, while they may play tough, your average driver turns into a pissy teenager when pushed.